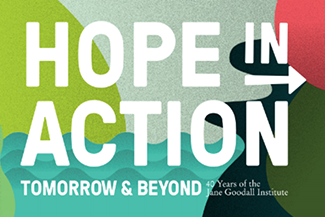 Nearly exactly one year ago, the Jane Goodall Institute was preparing for one of the biggest Roots & Shoots Celebrations of Service EVER! 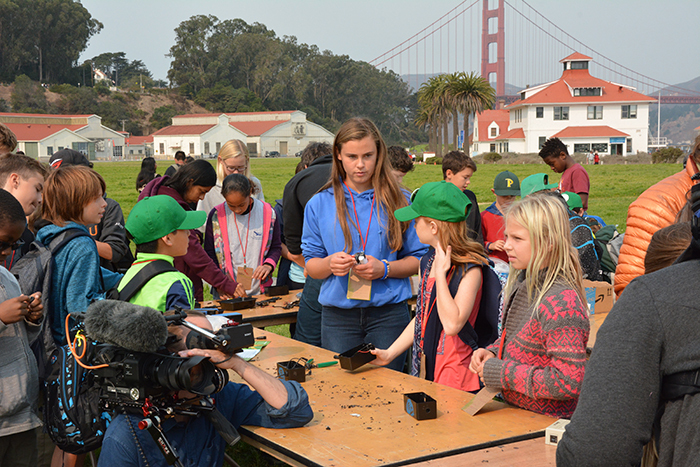 The event, which took place in Crissy Field in San Francisco, gathered hundreds of young people from all over the bay area showcasing the outstanding work of Roots & Shoots youth, local organizations, innovations, and community around being compassionate leaders in every day life. As we reflect back on all that was shared and created for the day, we’re happy to introduce Saskia Fisher, a Roots & Shoots youth who shined at the celebration and continues to show what can happen when you use your heart and your mind together to make a difference. 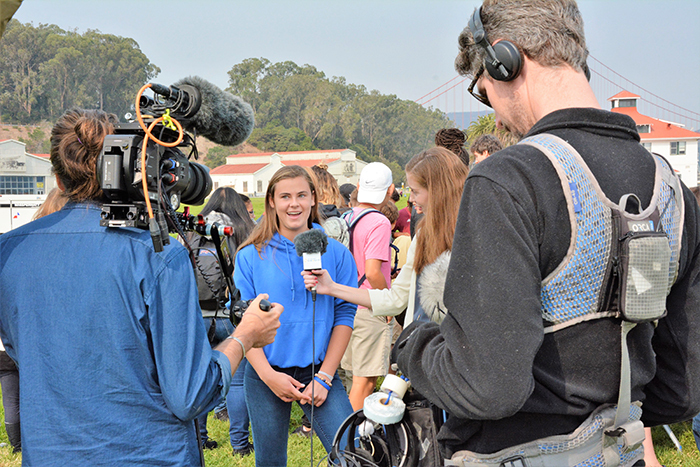 When I learned of Dr. Jane Goodall’s JGI Roots and Shoots youth program’s “call to action” to participate in their “phone recycling day,” I decided to initiate a week-long phone recycling drive at my high school in San Francisco. 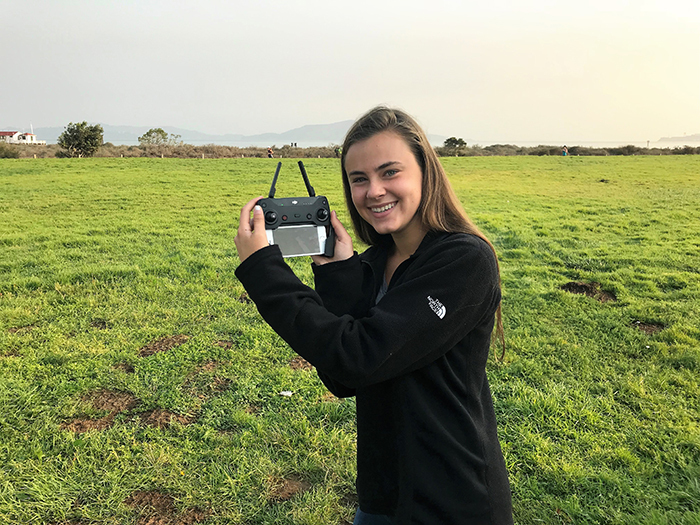 Not only did the idea excite me because these devices are so central to our generation, and SO many end up in our world’s landfills, but I also knew this effort would be a perfect fit with the work I was doing with another non-profit called Rainforest Connection. Rainforest Connection needed used phones, connected to small solar panels for charging, to place in rainforest canopies around the world to serve as first alert systems for illegal logging and wildlife poaching. This is a cool and inventive use of technology to listen for illegal activities and help solve one of the world’s major environmental issues was devised by Topher White, who also happens to be a graduate from my high school! When given the chance to join his small start-up team as a volunteer, I didn’t hesitate! Not only was it fun to help assemble these electronic “listening” systems, but it was amazing to be rewarded with a photo, weeks later, of one of the “Guardian” systems that I had assembled with my name written on it, placed up in the rainforest canopy in Ecuador. Accompanying the photo was a link to listen in realtime to the rainforest from my system, from which I can hear the sounds of birds, insects, and other wildlife in that section of rainforest. This technologic system using a recycled cell phone was now high in the canopy, helping to protect an important forest! I was truly mesmerized and proud. Helping protect rainforests is so, SO crucial because they serve as the “lungs” of our world, breathing in carbon dioxide and expelling oxygen that is required for life on our planet to continue. Of course, rainforest protection also preserves biodiversity, and enables indigenous human communities to continue their long-standing ways of life. Watch Saskia and Topher speak about their work at 1:48. 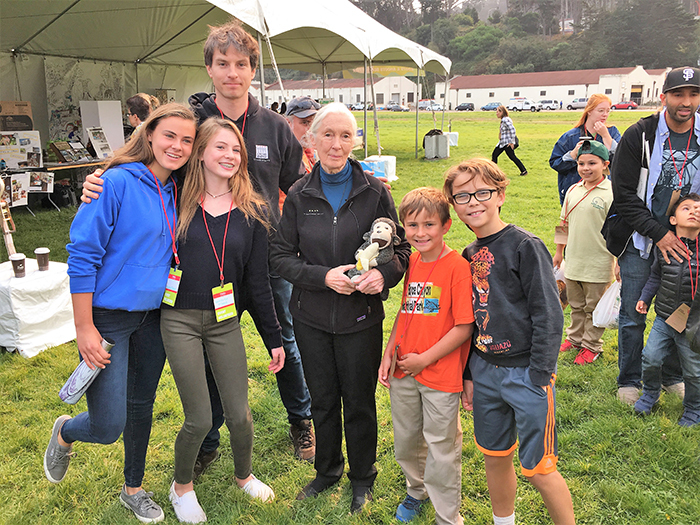 When Dr. Jane announced that she was coming to San Francisco to celebrate the 40th anniversary of her the Jane Goodall Institute with a Roots & Shoots youth festival, I knew I wanted to be a part of this important celebration. 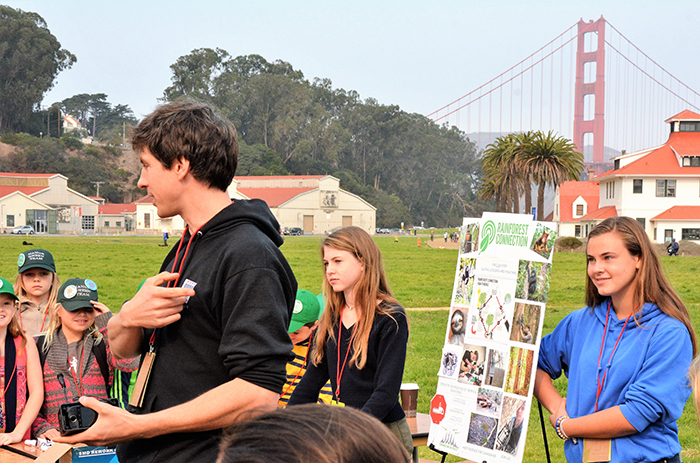 Topher White and I were invited to speak on stage at the outdoor festival, attended by over 500 students and their teachers with the Golden Gate Bridge as our background. These special opportunities to work with two amazing environmental leaders continue to inspire me. I’m now a high school rising senior doubling in science and considering majoring in environmental science in college. This summer, I will be learning to scuba dive so I can assist with marine conservation work. Someday, I hope to devote my life’s efforts to preserving and maintaining a healthy planet earth, with all of its amazing forms of natural life, for the benefit of all future generations of humans and other species. Get Inspired: Group members learn about Dr. Jane and Roots & Shoots. Members see how young people can be compassionate leaders and change the world. Get to Mapping: Members see aspects of their community that they did not see before using either digital or physical mapping exercises. Members identify characteristics, issues and resources for people, animals, and environment and narrow down their ideas into one campaign. Take Action: Get started on your project! Start a project profile on rootsandshoots.org. By identifying community collaborators and implementing the campaign plan, young people can make sure their work has the most positive impact. Members get friends, families, schools, and local businesses involved in their project. Then it’s time to measure Impact. Members conduct a post-assessment activity/survey to see how their community has changed and record their impact. Celebrate! : Members host an awareness service celebration! Members each receive a signed certificate. Together, they update their project profile on rootsandshoots.org with the final campaign outcome. Finally, members reflect on their project, and the impacts that they have made in their community, sharing their story to inspire and activate others! To start your own JGI’s Roots & Shoots project, visit here. See all the steps and resources to dive into the Four-Step Formula here. Next Article Introducing the Fund II Foundation Roots & Shoots National Fellows!